GE Healthcare announced the world premiere of Heroines of Health, a documentary by Emmy-award winning filmmaker Lisa Russell, MPH. 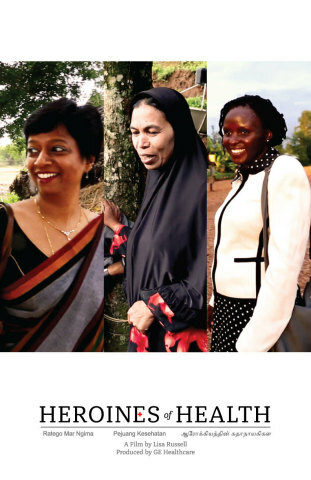 The film follows three heroines, from India, Kenya and Indonesia, who are overcoming steep challenges and expectations to bring better health and hope to their communities. Women comprise 75 percent of the global healthcare workforce, yet often their work is unrecognized. Heroines of Health brings to light the stories of women on the frontlines of healthcare who are quietly and humbly saving lives. Mrs. Rohani: A volunteer midwife’s assistant from a mountain village in South Sulawesi, Indonesia, Mrs. Rohani wakes up at four a.m. daily to join her family in a morning prayer before walking expectant mothers to the nearest community health center, more than an hour walk by foot. Mercy Owuor: A community health expert at Lwala Community Alliance, Mercy leads a team of rural health workers as they influence how one million people in Western Kenya access healthcare. Through a community-led approach, she is achieving her goal for every child to reach his or her fifth birthday. Dr. Sharmila Anand: Dr. Sharmila was trained in the U.S., but brought her passion for empowering and educating youth and young women back home to Chennai, India, where she founded SEHPL, a social enterprise that skills students to become X-ray technicians, OT technicians, anesthesia technicians and more. The goal is to give them meaningful employment opportunities and bridge the healthcare skills gap in India. She says her vision is to create a million satisfied patient smiles by transforming healthcare delivery systems through upskilling and empowering healthcare professionals. In 2015, GE Healthcare established Sustainable Healthcare Solutions (SHS), a business that partners with governments and non-governmental organizations (NGOs) to strengthen healthcare systems and improve the affordability and accessibility to quality healthcare in India, Africa and Southeast Asia. These regions also offer insight into the critical role women play in this effort, and that, when given the opportunity to lead in both community health and policy development, women have the ability to improve the health of millions of people. This realization was the impetus for an effort to engage our partners, public, private, non-profit and NGOs, in a shared determination to unleash the economic and intellectual power of women to accelerate the development of sustainable healthcare systems globally. With this documentary, GE Healthcare seeks to take one step forward by recognizing three of the many women who are bringing better health to their communities. “As a filmmaker who has been telling global health stories in remote locations for nearly 15 years, I have come across many incredible, committed women working at all levels in the healthcare industry. With Heroines of Health, it truly is my honor to give viewers an inside glimpse into the personal lives of three remarkable heroines,” said Lisa Russell, MPH. Watch 1 minute each day of the film @HeroinesofHealthFilm on Instagram. Lisa Russell is an Emmy-award winning filmmaker with a Masters in Public Health. She became interested in storytelling after working as a humanitarian aid worker during the 1999 refugee crisis in Kosovo and started a career directing, producing, shooting and editing films for UN/NGO agencies on pressing global health issues such as maternal health, girls education. HIV/AIDS, impact of war on youth, climate change and others. She is a keynote speaker (TEDxJNJ, SwitchPoint, Unite for Sight) and workshop facilitator with a focus on narrative justice and responsible storytelling and aims to change the narrative of global health through her work. In 2016, she launched StoryShifter, a new entertainment for the social good, powered by machine learning and data analytics. As a teaching artist, artist advocate and curator, she works to build institutional credibility around emerging artists as cultural diplomats within the global health and development community. For more information on Lisa’s work, visit www.lisarussellfilms.com.